Shawna Thayer never intended to make a career in charts and spreadsheets. 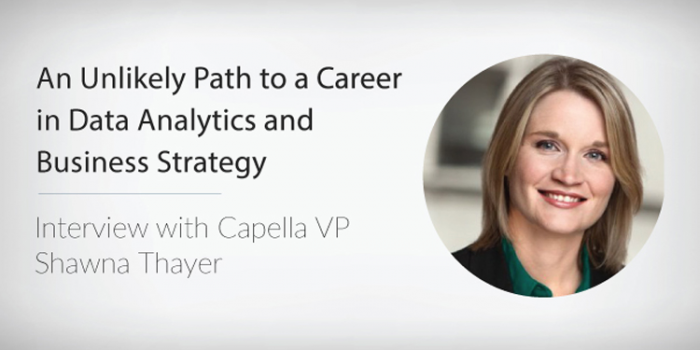 So how did she become Capella University’s vice president of data strategy and institutional analytics? The answer, Thayer admits, still surprises even her. After finishing her undergraduate degree at a brick-and-mortar school, Thayer enrolled in a traditional graduate program, planning to earn a PhD and embark on a career as a university professor. As part of her program, she studied statistics and learned to crunch numbers – an essential skill in academic research. She discovered she had an aptitude for managing data, but her real interest still lay in analyzing and drawing conclusions from large collections of it. Thayer went on to finish a PhD in Family Science, with a specialty in quantitative analysis and research design. Rather than seeking a post at a university, she leveraged her skills to land a position as a quantitative analyst at American Girl, a subsidiary of toy maker Mattel, where she worked on retail strategies, catalog tests, loyalty programs, and digital advertising metrics. Over the next decade, she went on to jobs at the data company Nielsen, the grocery retailer Supervalu, and a consulting firm, Analytic Partners. Her skill at managing and assessing data, along with her background in the social sciences and her communication skills, propelled her up the career track quickly. Thayer is encouraging of other women who want to enter the field and notes that Capella has a great track record in educating women who want to make a career in data. And she has some good advice. “You need to know how to handle both structured and unstructured data; know how to learn coding languages; and have savvy technical skills,” Thayer says. Perhaps not surprisingly, she also encourages people to take career risks. She made a switch that ultimately paid off – even if at first it seemed like a crazy turn on her life path. “If you’d have asked me then if I ever thought that my future career was going to be in statistics or analytics, I would’ve laughed,” Thayer says. Capella offers certificate, bachelor’s, master’s, and doctoral degree programs in data and analytics.